Abbess has the expertise in designing and manufacturing ultra-low temperature refrigeration units to fit a wide range of needs in science and industry. 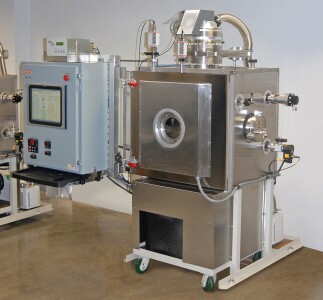 This thermal vacuum chamber is fitted with a robust and efficient cascade refrigeration system. Abbess’s Cascade Refrigeration Systems are the most powerful closed loop cooling systems that Abbess offers. These systems eliminate the high running cost of liquid nitrogen(LN2) systems by efficiently reaching temperatures as low as -96C. This Cascade Refrigeration System can be configured to incorporate any thermal load including those offered by Abbess such as a thermal plate, finned heat exchanger or a recirculating thermal fluid. If you require temperatures only down to -40C check-out Abbess’s -40C Single-Stage Refrigerator! Our cascade refrigeration system is capable of -96C! 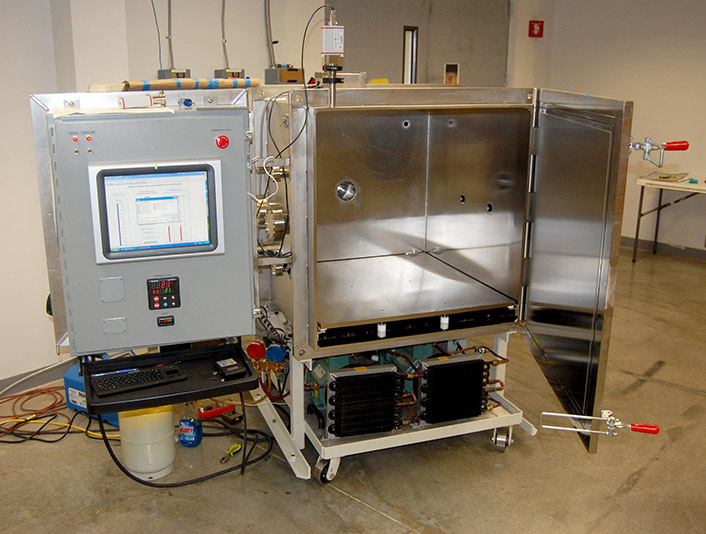 These refrigerators can be used in conjunction with our vacuum systems to provide space simulation profiles or they can be customized to provide cooling for a variety of other applications such as medical storage and freeze drying. 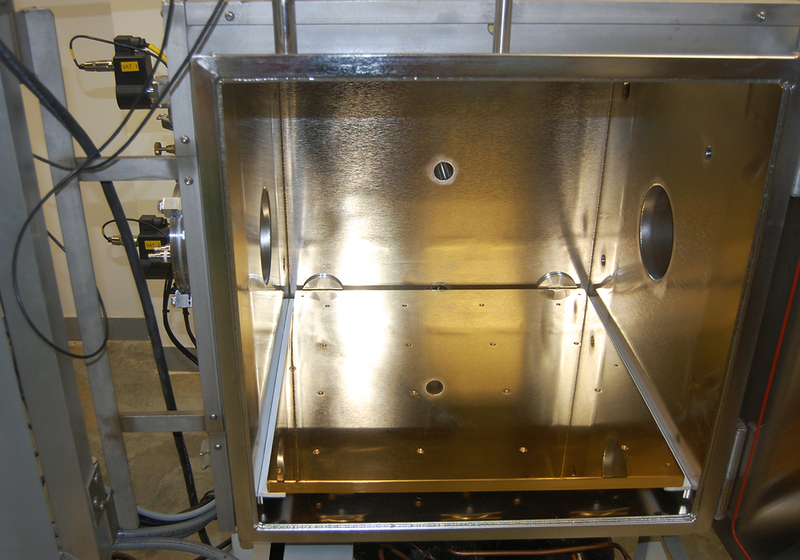 These systems are entirely customizable and can be sized to cool your product, environment or working fluid at various rates. Our refrigeration systems have been proven to be reliable and low maintenance in NASA simulation systems for years and have earned a reputation for quality, performance, and control that is simply unmatched. Abbess also provides support both on-site and off-site for all of our refrigeration systems. Check-out our cascade powered Snow River Chillers! Our refrigeration systems come in a variety of sizes and configurations to fit your application. Refrigeration and vacuum systems can also be custom configured in sizes ranging from 1 horsepower to 34 horsepower systems and can be designed to operate at low(-40C) and ulta-low(-96C) temperatures. 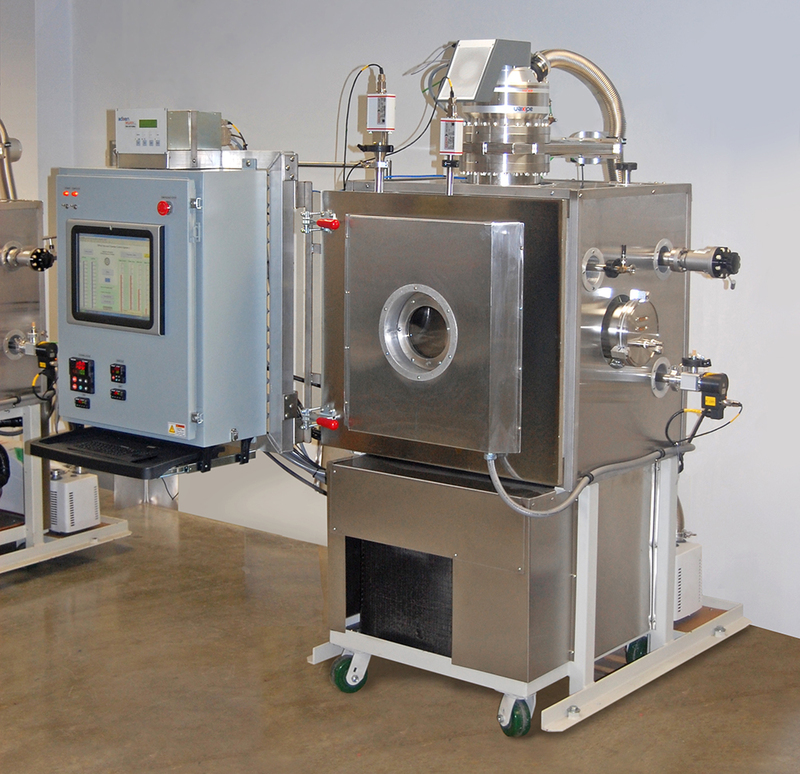 These refrigerators can be used in conjunction with our vacuum systems to provide space simulation profiles or they can be customized to provide cooling for a variety of other applications such as medical storage and freeze drying. 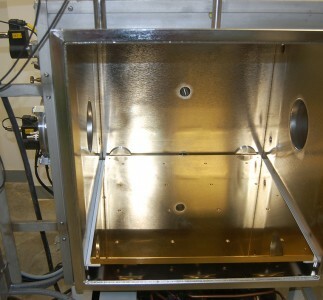 These systems are entirely customizable and can be sized to cool your product, environment or working fluid to specific temperatures at various rates. Abbess offers a variety of control and diagnostic packages that can fit your specific application and budget. These control systems could be as basic as a simple thermostatic control or as advanced as a data logging touchscreen PC interface capable of integrated system diagnostics. Stand-alone PID Temperature controllers can also be utilized for simple, precise thermal control and profiling. Thermal platen, bright nickel polished, custom designed to customer specified requirements for thermal coherence and ramp rate to the test simulation. High Vacuum Test System with Cascade Refrigeration, configured with Custom PC/Touchscreen GUI Controller with robust datalogging functionality for LEO Space Simulation.